The tweet went out at 4:23 p.m. on June 28, 2012, and became the most popular ever produced by the cult automaton @Horse_ebooks. So far, anyway. As of this writing, it has been tweeted 7,663 times; favorited 5,046 times; and left 4.2 million impressions, the number of accounts that have conceivably seen the tweet based on Horse’s followers, and the followers of those who retweeted and favorited it, according to the data analytics firm Union Metrics. In the larger and ever-fluid universe of popular tweets, Horse doesn’t make much of a dent. President Barack Obama’s “four more years” tweet on election night last year is considered the most popular of all time, with 798,122 retweets and 299,023 favorites. Lady Gaga and Justin Bieber routinely get tens of thousands of retweets per tweet. Serious evaluation of a spam robot’s tweets may seem counterintuitive, ridiculous, even. Part of what makes the account so appealing is its absurdity. 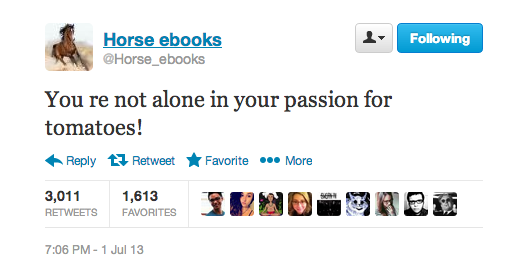 Horse_ebooks tweets are delightful non sequiturs — or, you know, “some of the most moving poetry of our age,” depending whom you ask. And that’s just it. Horse is simultaneously meaningless and meaningful, wildly surreal yet deeply existential. In a typical Twitter feed filled with news and jokes and other snippets of information or opinion often published by actual humans, Horse seems to know just when to show up with an all-caps tweet or a mysterious fragment. Ah, humans, always looking for meaning. That so many people have happily latched onto random wisdom from a spam robot feels vaguely like pareidolia, the tendency to see our own likeness everywhere we look — the man in the moon, the Virgin Mary on a piece of toast, etc., etc. But considering Horse_ebooks within the context of the Twitter platform also hints at another part of the account’s appeal: Horse undermines our sense of self-importance and control, reminding us that the things and ideas that captivate us moment to moment, the narrative we’re jointly weaving together — in 140-character bursts or elsewhere — is maybe not so meaningful. So maybe Horse has become a reflection of who we are, a distorted and splintered mirror image of what Internet culture is made of. Actually, that may literally be the case. 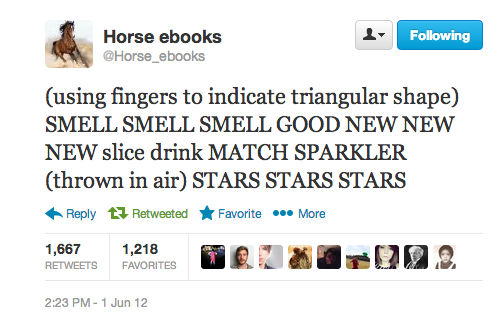 If, in fact, the algorithm behind Horse is designed to crawl the web for text, then randomly spit out chunks of what it finds, enough is out there about Horse_ebooks at this point for it to at times become self-referential. In the meantime, Horse_ebooks continues to inspire fan fiction, parody, T-shirts, posters, dating advice, comic strips,a mock campaign speech, YouTube animations, at least one yearbook quote, poetry, and academic study. This may be an entry point for our attempts to connect these theories of authorship to @Horse_ebooks, as Twitter functions as ‘posts on a wall,’ but typically not with any anonymity… However, we then run into the problem that @Horse_ebooks has no “life.” Its tweets are individual, self-contained pieces of truncated data and arrangements of words than have no inherent or intended meaning. And yet the people who interact with the Horse_ebooks account on Twitter are overwhelmingly finding (or pretending to find) meaning in what it tweets. Just about any Horse_ebooks tweet prompts a smattering of encouraging and discouraging responses, everything from “TELL IT SISTER” to “shut your trap,” the latter of which is positively benign compared with the hostility Horse sometimes inspires. Sure, for some people the Internet is just a place to swear into the abyss. But maybe for others, Horse hits a little too close to home. What is it about a simple spam robot that elicits such a range of silly and serious and funny and mean and random and thoughtful and vulnerable and honest reactions? The predictable dashed-off replies: ALWAYS. yeah. yes. Always. Yah. Trying to unpack Horse_ebooks is a bit like analyzing a joke. Study it too closely and the magic begins to evaporate. Of course, the account could disappear altogether at any moment. But for now, three years and counting, Horse tweets onward.